I have quite a few gift-giving events coming up in the next few months, including a sprinkle for my sister-in-law who is due with my godson in October and my cousin’s daughter’s first birthday. So I’m glad to have been introduced to Minky Couture – makers of soft and luxurious blankets for babies, teens and adults – the perfect gift for any occasion! Minky Couture was started in 2009 by Sandi Hendry, who was known for her unique, fun and stylish gift giving. When she discovered the minky fabric, she created unique blanket designs for friends and family that were an instant hit – and when she was asked if they were available for sale, Minky Couture was born! Besides being soft and luxurious, Minky Couture blankets are individually made by an experienced talented seamstress that put lots of love and attention into each blanket. They have a variety of sizes and options to choose from and can customize their designs to your needs. They are great for baby shower gifts, kids going away to college, friends, family, anyone who can appreciate warmth and style. They even offer matching pillows, fitted sheets and blankets for dolls and pets. I received two blankets for review. 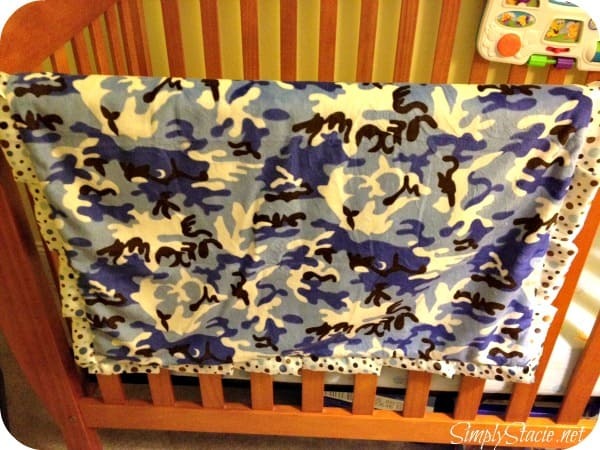 The first is the Blue and Brown Camouflage infant blanket for my youngest. The design is fun (especially since my husband was in the military – very fitting!) and the blanket is super soft. The soft minky fabric on the other side of the design is warm and cozy. I like the little polka dot satin fringe – such a cute little touch on this boy design. 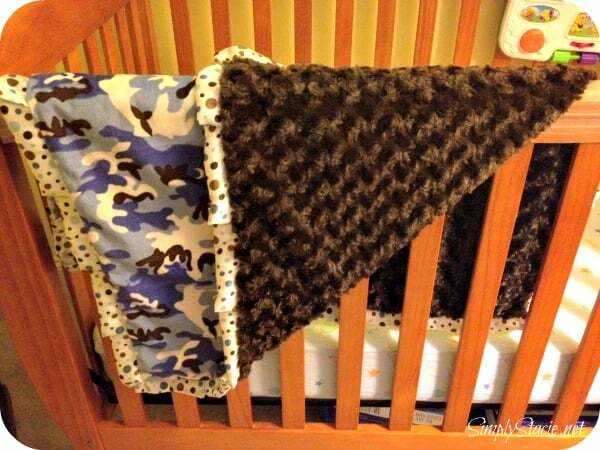 This is a great blanket for those long cold car rides in the winter, napping in the crib, or just lounging around. 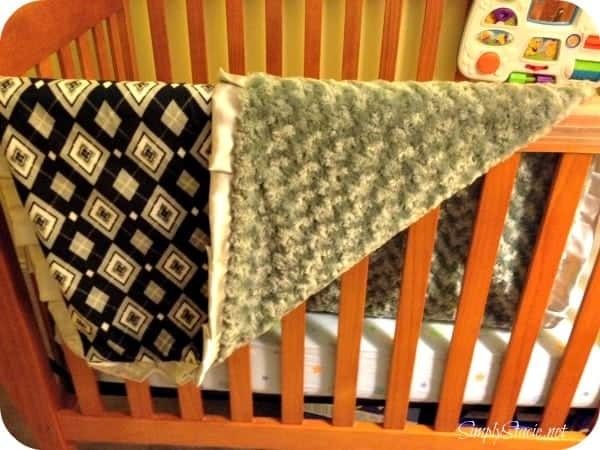 Measuring 36×30, this blanket is a great smaller size for little ones. The blanket sells for $60. The second blanket is the Michael: Black and Grey Diamond with Silver. Measuring 36×50 in the “Tween” size, this blanket is well suited for my older son – as an extra layer on his bed, or perfect for those chilly winter nights watching a movie on the couch. The design is a great fit for an older child or adult. The “Tween” size sells for $85. You can see more of the Minky Couture style on their website. I like the Kami: Leopard Print with Pink blanket. I like the Betsy Silver blankie. I love the Hot Fudge Minky Blanket. I like the look whoos royal blue. I like The Angel Blue Minky Blanket! I like the Who’s Who owl blanket in brown. i like the white snow leopard print. I like the Jake infant blanket. It has to be a custom Blanket, My choices would be champagne with a Sydney Ruffle for a Tween. I love the Creme Brulee with Ruffle. I like the Angle blessings in pink. Caribbean Blossom: Caribbean Aqua Blossoms with Brown and Cream. The adult-sized Silverlicious Pink: Silver and Pink Shapes is one of my favorite Minky Couture items. I think they are all beautiful but right now I’d love to have the Audrey: Light pink with a Rosebud Chiffon Stitch for my new great granddaughter. Angel Blue: Blessing Blanket with Blue Satin, and White Minky Swirl. Daisy Duke: Teal, Pink, and Yellow Flowers. The Violet Blossom Silver blanket looks very nice!